The long-awaited sequel to The Phoenix Guards and Five Hundred Years After. Two hundred years after Adron’s Disaster, in which Dragaera City was accidentally reduced to an ocean of chaos by an experiment in wizardry gone wrong, the Empire isn’t what it used to be. Deprived at a single blow of their Emperor, of the Orb that is the focus of the Empire’s power, of their capital city with its Impe-rial bureaucracy, and of a great many of their late fellow citizens, the surviving Dragaerans have been limping through a long Interregnum, bereft even of the simple magic and sorcery they were accustomed to use in everyday life. Now the descendants and successors of the great ad-venturers Khaavren, Pel, Aerich, and Tazendra are growing up in this seemingly diminished world, convinced, like their elders, that the age of adventures is over and nothing interesting will ever happen to them. They are, of course, wrong. For even deprived of magic, Dragaerans fight, plot, and conspire as they breathe, and so do their still-powerful gods. 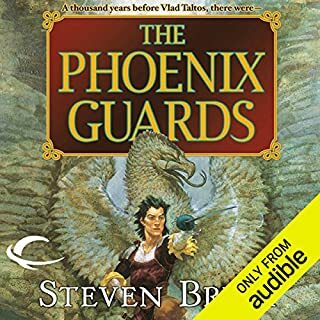 The enemies of the Empire prowl at its edges, in-scrutable doings are up at Dzur Mountain...and, unex-pectedly, a surviving Phoenix Heir, young Zerika, is discovered—setting off a chain of swashbuckling events that will remake the world yet again. 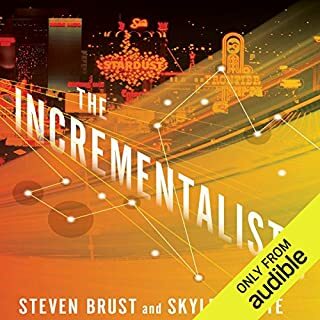 ©2002 Steven Brust, Emma Bull, Teresa Nielsen Hayden (P)2012 Audible, Inc. 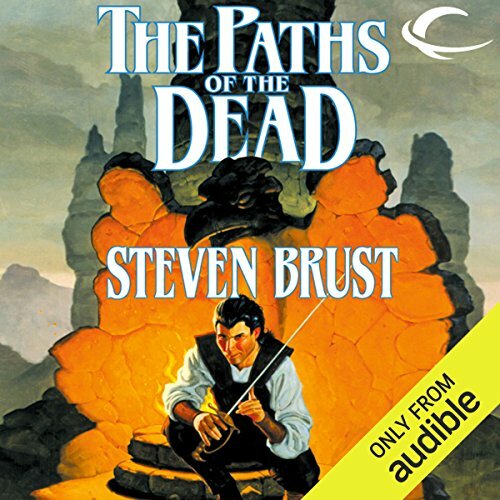 The Paths of the Dead is the first book in Steven Brust’s THE VISCOUNT OF ADRILANKHA trilogy, which is a sequel to The Phoenix Guards and Five Hundred Years. Each of these books is an installment in Brust’s KHAAVREN ROMANCES and they’re all related to his VLAD TALTOS books which, at this moment, consist of 13 novels. All of these books have just been released in audio format by Audible Frontiers. I picked up The Paths of the Dead after reading that it can stand alone. You might wonder why I started here and, honestly, it’s because we already had reviews for some of the VLAD TALTOS novels and for The Phoenix Guards and Five Hundred Years but none for any of THE VISCOUNT OF ADRILANKHA books. 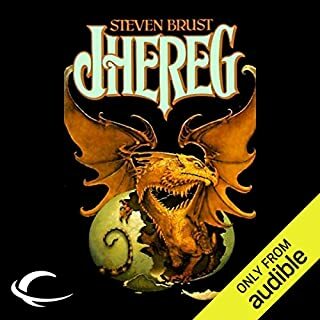 I now realize that it would have been better to start with the first VLAD TALTOS novel, Jhereg. 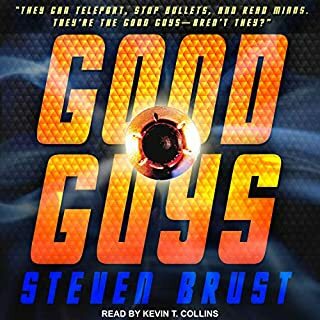 Our omniscient and intrusive narrator assures us that no history is required to enjoy The Paths of the Dead, but I found that I wished I had the background to more thoroughly relate to our heroes. They’re descendants of the characters in Brust’s previous novels and they’re associated with “houses” which are known by their particular personality traits. While relevant information is occasionally briefly explained in The Paths of the Dead, I felt like I was missing the rich history that would have increased my enjoyment. Nevertheless, I can talk about the plot and the style of this novel. 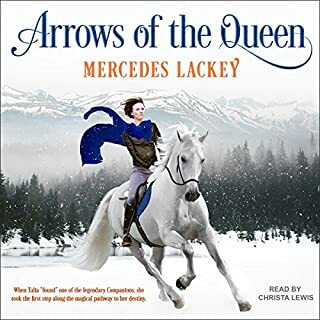 This is the story of how Zerika, with a little help from her adventurous friends, went to the Paths of the Dead to obtain the Orb which would restore the empire to its former glory — a story referred to in the other Brust books. Most of The Paths of the Dead is set-up for this event which takes relatively few pages at the end. There is also some history on Morrolan and a few other characters that Brust fans are familiar with. Felt like having to take a very boring history class. Long drawn out absurd descriptions , inane conversation, and twisted rambling plot. Burst usuall tells a very compelling interesting story. This is like a passive aggressive slap at his publishers and audience . It was ok. Every chapter had a historical narrative overview or something. And conversation structure of the people, which was probably written that way to make them unique, just dragged out the conversations. Other than that it had a good story. Amazing Series, and amazing narration!!! Have you listened to any of Kevin Stillwell’s other performances before? How does this one compare? Yes, it's as well narrated as the rest of his work!